I love to have a few quick and easy treats up my sleeve like haystack cookies, cookie dough dip and microwave fudge. 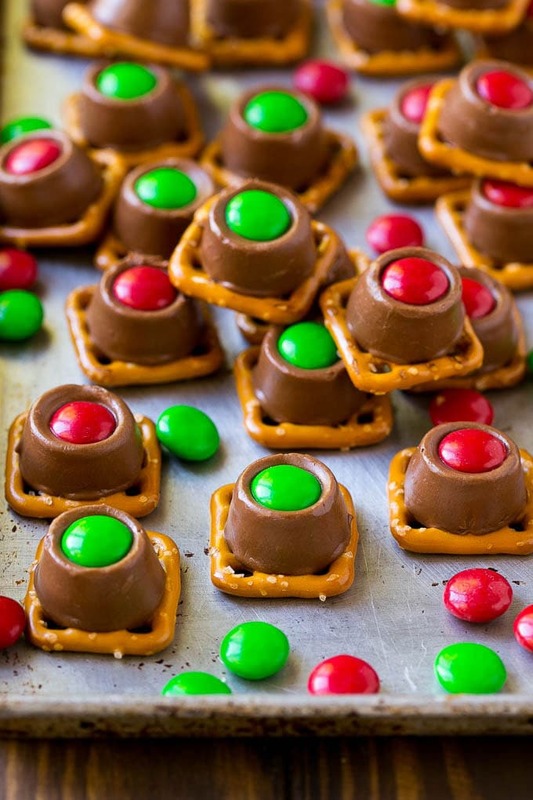 Rolo pretzels are also a favorite because the kids can help make them and they’re totally delicious! Sometimes you just need an easy dessert without a lot of fanfare and dirty dishes. These Rolo pretzels can be made with a moment’s notice, the hardest part is waiting for them to cool after they’ve come out of the oven! This recipe couldn’t be any easier, it’s just 3 ingredients! 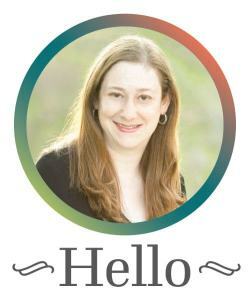 You’ll need pretzels, Rolo candies and M&M’s. I like to use square pretzels because I think they look nicer in this application, but you can also do traditional pretzels if you prefer. 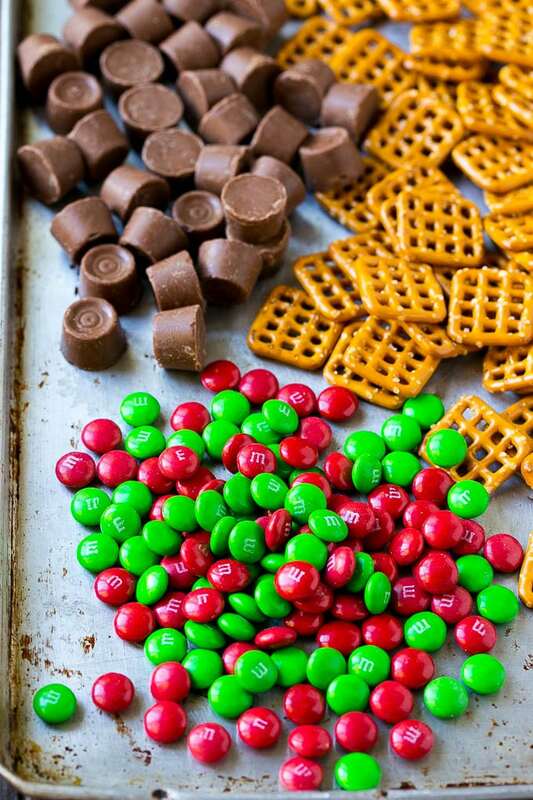 I typically make these Rolo pretzels around the holidays, which is why I’m using red and green M&M’s. You can use any other color M&M that fits your occasion if need be. 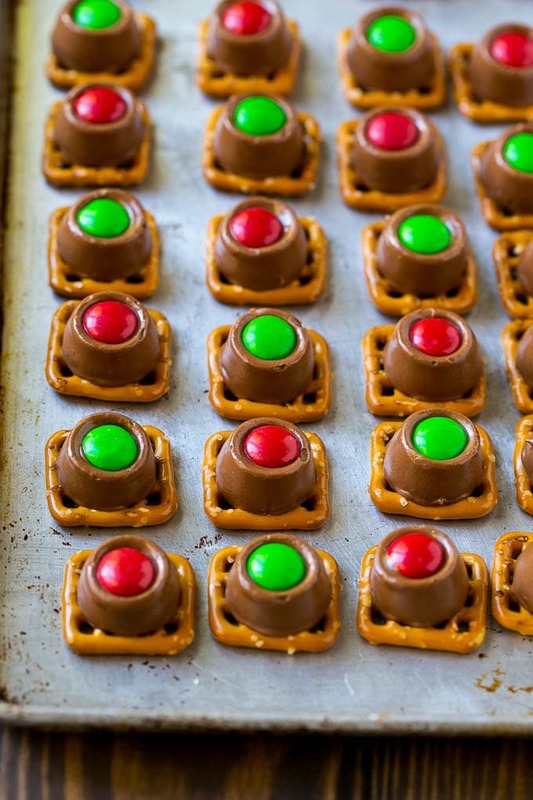 The pretzels get lined up on a baking sheet and each one is topped with a Rolo candy. 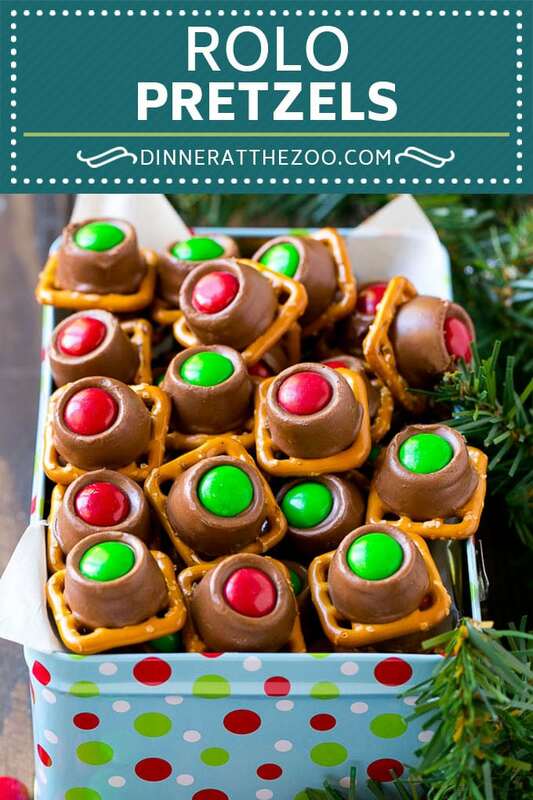 The pretzels go into the oven just long enough for the Rolos to soften – you don’t want them completely melted, just soft enough so that you can press an M&M into the top of each one. After the M&M’s are added to the top, let the chocolate set back up and you’re ready to eat! 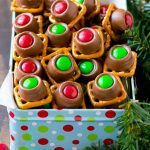 I love to package up these Rolo pretzels in tins and give them as holiday gifts for family, friends and teachers. My girls really enjoy this because this is one of those treats that they can make with little adult help, and they’re always proud to show off their handiwork. There’s just something special about that salty-sweet flavor combination and these Rolo pretzels have it all. Between the crispy pretzels and gooey caramel, this is a treat that no one will be able to resist. Line a sheet pan with a sheet of parchment paper or nonstick baking mat. Lay the pretzels out in a single layer on the sheet pan. 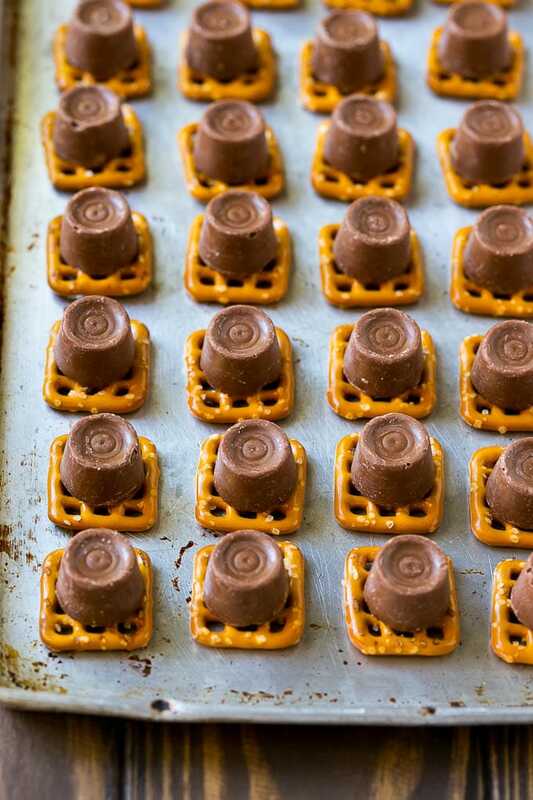 Place one Rolo on top of each pretzel. Bake for 3 minutes until Rolo candies have just started to soften. Remove from the oven and press one M&M into the top of each Rolo. Serve, or store in an airtight container for up to one week. Inspired by Mom on Timeout. I made these with the kids and everyone loved them! Great rainy day activity! These are so clever. I am always looking for new ideas for party treats. These will be this year’s favorite. I love these!! I wish I had discovered them before my mom passed. Rolo candy was her favorite and she love festive treats. These are so cute! 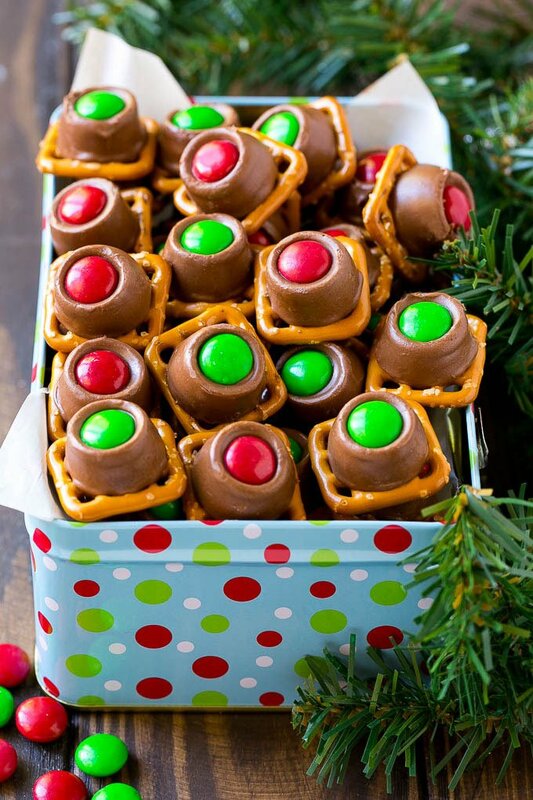 They are such a classic Christmas treat that my family would love. I like to eat salty-sweet flavor treats and Rolo pretzels is perfect for me. I am amazed at how easy to make these and the ingredients are so simple. I will try to make some for my family during the Christmas holidays. This sound so so cute!! what an adorable! I love simple recipes like this that the kids can help with. And, you can NEVER go wrong adding Rolo to your recipes. These look like they would be a hit for the holidays. This is an awesome idea. I usually give food gifts to friends at work so this one is perfect! I love how colorful it is and I know it won’t go to waste because it is one, awesome delicious treat that the family will enjoy.